Conference attendees have much higher expectations in this modern era of content on demand. The future is bleak for conferences that still rely on monotone lectures and contextual PowerPoint slides to fuel their presentations. Attendees who pay big bucks for a conference do so for the experience. This means they want access to things they can’t read or achieve on their own. In the end, it is all about interactivity, and here are some great ideas you can implement into your conference to ensure you are meeting your guest’s expectations. If you’ve felt compelled to click on a website poll, then you already recognize the fun in comparing your opinion to those of others. Integrating real-time polls into your conference content is easier than ever thanks to new technology. You can even find phone applications available that will save you from renting dedicated polling equipment. 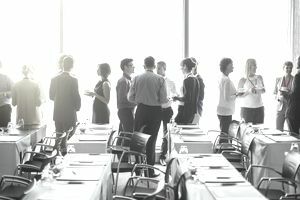 Develop a connection between attendees by turning your table assignments into teams. Kick your event off by having each team create a unique name and sign for their table. From there, you can implement activities like team projects, group discussions, and problem-solving scenarios. This is a great activity for any event that features an exhibit hall. Send your guests on a race to match vendors with the clues you provide. Not only is it fun for the attendees, but your vendors will appreciate the additional engagement opportunity. Use large whiteboards or cork-board to design a creative space for your guests to share messages, business cards, and unique offers. Planners can utilize the space to post reminders and share pictures from earlier events. Other ideas include using the graffiti board to host comments, contest submissions, and attendee bios. One of the best reasons to offer post-event entertainment options is to keep attendees engaged after hours instead of letting them retreat to their hotel rooms. Popular options for offsite events include happy hours, sightseeing tours, and sporting events. Functions like these can build lasting friendships and enhance the conference experience beyond just learning. Avoiding lecture-style education sessions should be a priority, but it does take strategic planning. One option is to incorporate panels into your learning tracks. With these, you assemble three to five experts on the stage at the same time. Questions are then presented to the panel, and each member is offered a short time to share their opinion. It works well because attendees get multiple answers to each question asked. In this format, multiple speakers present in the same track under a strict set of guidelines designed to keep the information flowing. For example, a session might feature five speakers with each one scheduled for ten PowerPoint slides and ten minutes to present their ideas. The result is a fast-paced session that changes topics several times to keep the audience on their toes. One of the best ways to keep attendees engaged with your conference is to keep them comfortable in their surrounding environment. This can be done by adding lounge furniture, coffee stations, WiFi connectivity, and charging stations to your common areas. Art displays and other conversation pieces are also good additions to the open space found in hallways and staging zones. The goal, of course, is to keep your guests on-site between sessions, instead of running to their cars and hotel rooms. Picture your guests as a pack of wolves on the prowl to devour new content. Feed them well, even between sessions, by incorporating multiple channels of information. You can add LCD monitors to the common area that stream conference updates and speaker interviews. This content can also be streamed through a website or custom built phone application. Some conferences even employ floor hosts to walk around and chat with attendees and vendors. A big part of building an interactive conference is to understand what your guests expect to get out of the event. It doesn’t hurt to add a question or comment box to your registration form to gauge attendee’s expectations in advance. You might have to scramble to implement a new feature, but if it fills a need, then it is sure to pay off in the long run.